Celery…for dessert?!? What are you up to this time, Jolly Tomato? This year, our friends at Duda Farm Fresh Foods are hosting a “Sweet Celery Bake-Off” and we were so intrigued about using celery in desserts, we knew we had to give it a try. Our thinking went like this: Celery is basically 95 percent water. Aside from a mildly distinctive celery flavor, there’s nothing about it that would ruin a dessert. In fact, it might even add a surprisingly fresh twist. So we set out to think of a tasty dessert that would still seem appealing even with “celery” in the title. 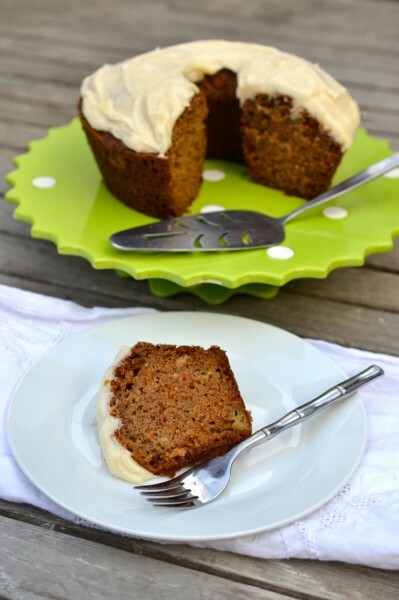 We were inspired by the idea of carrot cake, and we decided to play on that to make this pretty celery-carrot tea cake. In a small bowl, combine flour, baking soda, salt, and cinnamon, and set aside. In a larger mixing bowl, whisk together the four eggs until evenly yellow. Add the oil, sugars, carrots, celery, and ginger root, and stir all to combine. Slowly add in the flour mixture, and stir until just evenly moistened. Grease a Bundt pan and pour the batter into the pan. Bake at 350 degrees for 55 minutes or until a toothpick comes out clean. Cool in the pan, then remove. Optional: Frost with cream cheese frosting. Serves 10 to 12. Got a great idea for a celery dessert? Enter it in the Sweet Celery Bake-Off by July 11! It is, isn’t it! Thanks, Dorothy!